Originally published at St. Michael Patch. School’s out and summer has arrived – at least the calendar tells us so. The weather has been rainy and blah – perfect for planning a summer filled with fun reading activities! My son seems to be taking a break this week from his usual reading routine, but I don’t plan to let that continue much longer. This summer, in addition to the usual Summer Reading Program at the St. Michael Library and at a couple of local bookstores, I’ve got a couple of new tricks up my sleeve. 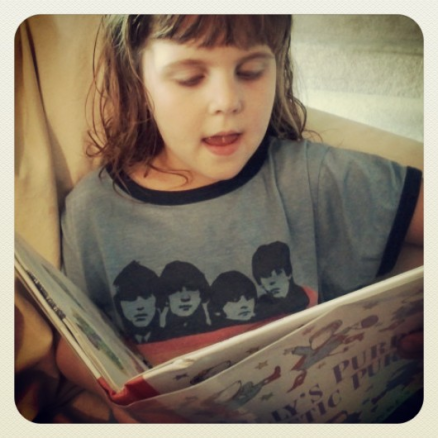 You may recall that last year my daughter and I took on the 100 Picture Book Challenge. This year, I’ve come up with a few new reading challenges. Reading aloud to your child is so important at any stage of learning, so this challenge is perfect for babies on up! I have very fond memories of reading A Light in the Forest by Conrad Richter aloud with my father in the family room after dinner one winter – we took turns reading chapters. I also hold very dear the memories of reading the Harry Potter series aloud to my son over the course of a couple of years. I had not read the books before we read them together, and that is an experience with him that I will always cherish. Reading together is so easy and can be done anywhere – in the backyard, on the front porch, on a boat in the middle of the lake. Read aloud to one child while another finishes baseball practice or swimming lessons. Take turns reading aloud – give your child a chance to stretch their reading skills and improve their vocabulary and fluency. Choose to read one book over the summer or choose dozens. It’s up to you (and your child’s attention span). At our house, my daughter and I are reading Harry Potter and the Sorcerer’s Stone together (on the nights she wouldn’t rather read me a picture book or early reader) and my son and I are tackling The Hunger Games. Read aloud together at least five days every week. You might read for five minutes or you might read for 30. The amount of time you read each day doesn’t matter. Just keep reading. Take turns reading aloud, ask your child questions about the text, point out interesting elements of the illustrations. And that’s it. Download the Read-Aloud Challenge Tracker and start today. You can choose to track your time or just put a checkmark in the box for each day you read together. There are plenty of great choices for both younger readers as well. For the younger set, how about a challenge to read every Fancy Nancy or Mr. Putter and Tabby book? This one is easy enough – choose one author and read every book they’ve written. This works well for the teens and grown-ups in your house, too. I’m planning to re-read all of Jane Austen’s novels this summer. Just what it says – read 100 different picture books. You can read all about it here. Make these challenges fun for your kids. Offer small prizes or rewards at various points throughout the challenges. Mix and match – what works for one challenge will most likely work for another. Most importantly, be involved. Take your kids to the library and help them choose books for the challenge. Share a favorite series or author from when you were a kid. Read Harry Potter together. Yes, your child’s reading skills will improve as they keep reading, but the time you spend together is what matters most. What books are you and your kids reading this summer? What are some of your favorite series or authors? I have fond memories of my mom reading aloud stories to us. Roald Dahl was a definite favorite at our house, as was Thunder Cave. We're big on reading at our house too. So much so that my kids don't really need a challenge. My 7 and 9 yo read at least a book a day and my 5 year old is getting closer to reading on her own. Still, I think doing one of these could be good. I think I'll pick the read aloud one since I'm the one getting busy and missing out on reading to them on a daily basis. Thanks for sharing and happy summer reading. You're so right that reading to your child is important at any stage of learning. My son is thirteen, and I still read aloud to him. It's one of those special things we do together, and I'm not looking forward to giving that up someday (like when he moves out, ha!). This summer we need to finish ANNE OF GREEN GABLES and tackle ENDER'S GAME before the movie comes out. Now there's a great mix! Have fun reading HARRY POTTER and THE HUNGER GAMES to your kids! Those were two of our favourite series to read together! I LOVE this idea, Sara! We're always looking for interesting ways to help parents and children read together over the summer. Some prefer to just read whatever they like, and some prefer a more structured program. This is great because it sets goals, and I'm all about the goals! Thanks, I'll be sharing this great list of ideas on our library blog! These are great challenges. I particularly like the series and favorite author challenges since I've done those myself.